THE SOCIAL NETWORK SEEKS TO FOSTER MORE RESPECTFUL FREE EXPRESSION AND AVOID REMOVING ACCOUNTS. In order to foster a more open and participatory respectful expression, Twitter announced a series of reforms regarding standards of behavior in the social network. The idea is to prevent abusive behavior, and eliminate behaviors that incite hatred and violence advocacy groups. Via the twitter blog, the platform unveiled some measures, within the framework of the criticism the network has received for their poor regulation and monitoring of recruiting and propaganda activities of organizations like the Islamic State, prior to the attacks that occurred in France. Twitter said it will refine its control tools in order to apply more drastic measures against those who behave in a manner not allowed in the social network. What measures will the platform take when they see an issue? 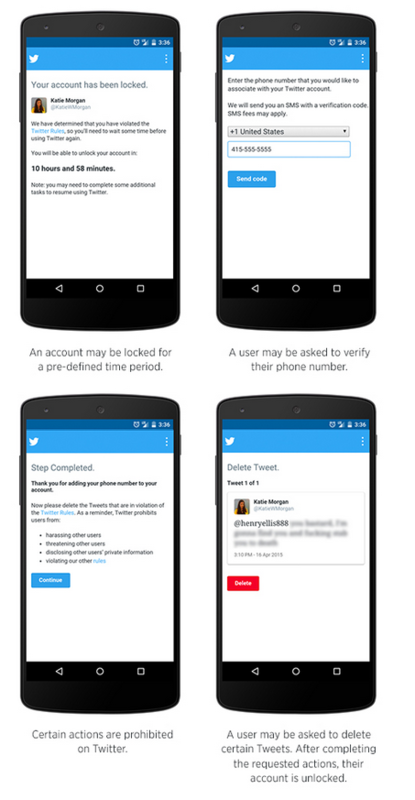 According to the official blog, the first thing twitter will do is block the account for a period of time. Then the owner of the account will be required to verify their email and phone number. Lastly, the account owner will be required to delete the tweets deemed to be in violation of the TOS before the account can ber unlocked. The reaction Twitter is a response to the request of lawmakers United States Congress, who proposed a bill in which social networks required to report to federal authorities any terrorist activity. Among the clarified rules, the expressed prohibition of the promotion of violence or threats against persons receiving these by race, ethnicity, nationality, sexual orientation, religion, gender, age, disability or illness.